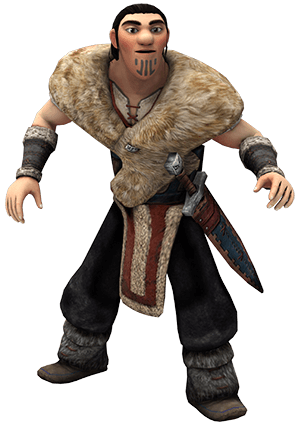 Eret, Son of Eret is a former dragon trader who has allied himself with Hiccup and the other Riders of Berk. He was once a notorious dragon trapper who worked with the evil Drago Bludvist. Over time, Eret began to see the error of his ways after being saved by Stormfly. He then teamed up with the riders of Berk to help defeat Drago. Tall, muscular, and handsome, Eret can appear arrogant and overconfident, but beneath his cocky exterior lies a true hero with a good heart. In fact, Eret has been a constant presence around the Training Grounds, providing assistance to young dragon trainers. He has not only proved to be a great help at the School of Dragons, but he's always ready to charge into battle on his Rumblehorn, Skullcrusher, to defend the Archipelago. Should you need to pay a visit to Auction Island, Eret will be glad to help you navigate through the archipelago’s seedy underbelly. As a former dragon trader, he used to be a familiar face on the notorious island. While he has long cut ties with his old dragon trader buddies, he still knows his way around and is willing to help you navigate the ins and outs of this lawless land. 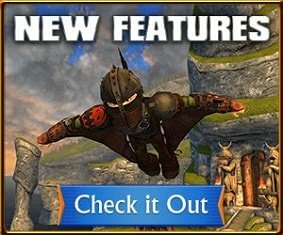 Here, Eret can help you get information on the whereabouts of enemies of the School of Dragons, or the two of you can team up to release captive dragons from the clutches of nefarious traders. If you need his help at the School of Dragons, you can seek him out near the docks over at the Training Grounds. Yesterday, Eret and I journeyed to Auction Island. I had never met a dragon trainer up close. I thought about Eret, who always seemed so at ease on these types of missions. Did he miss the hunt? Did he miss the money that came with dragon hunting? These were the questions that ran through my head as we sailed on his ship to Auction Island. After we docked, Eret escorted me to the hub of the vile dragon trade. Although we didn't have the protection of our dragons, we went ahead determined to track down Harald Forkbeard once and for all. We crossed the island with ease as Eret led us through secret tunnels and around rocky cliffsides. Once we reached the Auction Zone, I saw Eret’s lips curl into a scowl. I knew then that his dragon trading days were over. As for me, I was just grateful to have such a knowledgeable and trustworthy companion in Eret, Son of Eret.